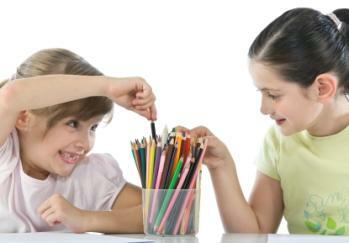 Enrolling your child in a summer art camp can help her get in touch with her creative side. No matter how old your child might be, he has probably participated in some kind of art project. It might have been as simple as coloring a picture, cutting out letters, or simply drawing a stick figure. The type of project he worked on wasn't nearly as important as the lessons he learned while he completed it. Your child might be a budding Picasso, or he might have little artistic talent. The point really shouldn't be about how talented he is, at least not initially. When a child works on any form of art, whether it be music, painting, drama, etc., she gains so much. The shy child may reach out to others and learn to communicate more effectively. The overbearing child may learn how to work more cooperatively with a group. The insecure child may take extraordinary pride in his artistic accomplishments. The child from a low socio-economic environment may learn about a world that is possible outside of his neighborhood walls. Art can do all of this and more, and a summer art camp can make this possible. Why type of summer art camp is your child interested in? Deciding on a summer art camp is much more involved than you might think. Do you want a day camp? A day camp will probably be the best choice for younger children, since they can go home at the end of a busy day. Keep in mind, however, that a day art camp may not be as art specific. In other words, instead of focusing on music, pottery, dance, or painting, the art may offer general instruction in a variety of art genres. This may be perfect for the student who really doesn't have a set interest as of yet. Do you want an overnight camp? Many children love the idea of going away for a few days or even a few weeks. There are numerous art camps available that offer intense art instruction. Again, you'll need to decide if you want a camp that focuses on one or two specific features, such as drama and dance or painting and pottery, or if you want a camp that is more general in nature. If your child is already showing potential talent in a specific area, you may want to seek out a camp that will help him hone his craft. Is money a concern? Unfortunately, talent specific camps, particularly those which host children overnight, are often quite pricey. Some camps may offer scholarships, however, so don't just assume that your child can't go before you talk to the camp director. If you simply want your child to experience the world of art, check with your local museums, recreation department and even nearby colleges and high school art departments. Any of these places may offer free camps or lessons that require a nominal supply fee. Where should you begin searching for a camp that will be right for your child? The Internet is a great place to start, but you have other options as well. Other parents-Talk to other parents who may know about art camps in the area. Art associations-Check out your local art galleries and/or art associations for information regarding a possible summer art camp nearby. Craft supply stores-Craft supply stores often feature a bulletin board that lists art camps and art lessons that are available. The following resources can help you in your search for the perfect art camp for your child. For more specific camps, do a Google search.